A few weeks ago I had the opportunity to speak publicly about my experience with sexual assault and healing. The event was called We Believe: A Benefit for SACE. 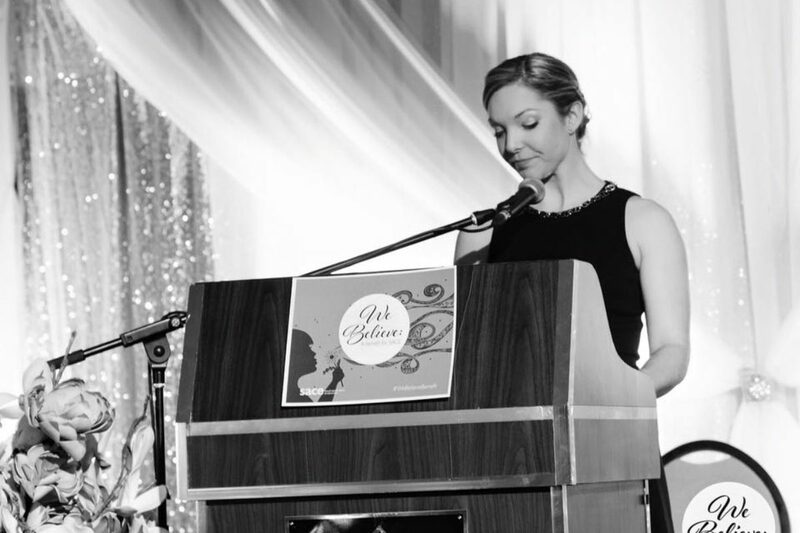 It was a fundraiser for the Sexual Assault Centre of Edmonton, where I went for most of my therapy. SACE is a wonderful non-profit organization and they offer their services on a by-donation basis. This allows so many people to access resources and therapy who normally would not be able to afford it. Without further adue, here is the speech! The fact that I am here at this event is a true testament to the work that the Sexual Assault Centre of Edmonton does. I first walked through the doors of SACE as a scared little shell of a human in the fall of 2012 and I spent so much time there, people probably thought I was a staff member. When my time with SACE started, I was a completely different person than who you see here today. I was afraid of my own shadow, I couldn’t string a sentence together to save my life, and I had a constant adrenaline rush. Now I only sweat and shake when I’m speaking in front of hundreds people. I could be anyone in the world, or anyone in this room. We all think that sexual assault is something that won’t happen to us, until it does happen to us. In the spring of 2012 I was out with some friends on a Friday night and I became one in three to five Canadian women who will be sexually assaulted in her lifetime. I met a guy in a bar on Whyte Avenue, a place most 22 year olds in Edmonton are familiar with. I got separated from my friends and ended up alone with him. That was the start to a night full of horror – it took 8 hours until I could figure out how to escape. I still wake up feeling his hands around my throat. It was a violent attack and I was lucky to have made it out alive. However, there was a long period of time where I didn’t feel so lucky. Panic attacks, flashbacks, nightmares, heart palpitations, and living in fear took over my life for a long time. I moved, I had to switch jobs, and I lost a lot of my friends. Every single aspect of my life changed, and not really for the better. I didn’t know what to call it at the time but I developed a bit of agoraphobia. Essentially I was afraid to leave my house, because I thought, or knew, that something bad would happen if I did. My home was the only “safe” space. My time with SACE started shortly after I filed a police report. I was very lucky to have a kind, compassionate detective. Staff Sergeant Sean Armstrong, who is here tonight, was my first responder in a way, as my family was far away and he served as a support network of sorts. He told me every step of the way that he believed me, and that he was doing everything in his power to help me. I was so glad to have someone so supportive and caring in my corner. I was devastated after finding out that charges were not going to be pressed in my case. I couldn’t stop crying, and he kept telling me that he believes me, and he is so sorry. Sergeant Armstrong called the director of SACE (Karen Smith at the time) to get me an emergency appointment, and he arranged for me to get there and home safely. When I found out that this event was called “We Believe”, I immediately thought of Sergeant Armstrong, as he was such a strong advocate for me and really embodied the support & sense of community that we are trying to create here tonight. Sexual Assault is an alienating experience. Truly, Like any traumatic event, it splits your life into two. It cracks it right down the middle, into “before” and “after”. Sometimes you’re stuck in the past, consumed by it, and you can’t run away from it fast enough. I spent months trying to outrun myself, until I was assigned to Lauren’s caseload and we started patching the pieces back together. She quickly caught on to my love for lists and always sent me away from her office with checklists, to-do lists or action plans. Lauren helped me manage the trauma symptoms – panic attacks and crippling night terrors. And when I was ready, we dug deeper. One of the biggest mental challenges I faced was my tendency to compare myself – where I am now – to where I was before the trauma. I was trying so hard to get back to ‘normal’ and Lauren was trying so hard to encourage me to accept that that may not be in the cards for me. Judging myself and desperately trying to find the old me was keeping me stuck in the past. Once I was able to accept that things are different now, through no fault of my own, I was free to move on with my life and work towards creating a new normal. Shifting from self-judgement to acceptance has had profound impacts on my life – both personally and professionally. I also went to group therapy at SACE. Being surrounded by people who understand what you’re going through lightens the burden and almost makes you feel “normal” again. My first session of group therapy was terrifying, but I saw so much progress during and after it. On the last day of my group therapy session, I still didn’t feel “fixed” or “better” and was very nervous about being done. Lauren and Shazeen sensed my apprehension and invited me to come back for another round. I was relieved when they asked, because I realized I needed more time, there was a lot of work left to do and they were happy to have me back. Thought I was going through the worst time of my life, I look back at my time with SACE fondly and have had some of my greatest ‘aha’ moments and breakthroughs in that building. What happened to me will affect me for the rest of my life, in ways that I sometimes can’t comprehend. It’s changed the way I do certain things and has brought on several new fears, anxieties and phobias. But I have learned to cope. I have rebuilt a really, really good life full of hope and opportunity. And besides, people like that I’m quirky, and They think it’s cute that I’m afraid of the dark… I hope! I had it pretty bad for a while. But some survivors have it much worse than I ever did. They are not believed. Their morals are questioned, they are painted as attention seekers, or threatened by their attackers. Sometimes they don’t have the capacity or resources to ask for help. Often, when we hear of sexual assault or abuse, our first response is not very supportive. “What were you wearing, why didn’t you leave, were you drinking?” Are often heard. We desperately need to reframe that in our minds. No amount of clothing or sobriety could have saved me from what happened to me, and it is not a victim’s responsibility to prevent sexual assault. Let’s change our first questions. To “How can I help? The attacker should not have done that. Are you okay?.” My story has had a happy ending, but so many victims do not get one. Let’s change that. Let’s listen, and offer support and encouragement. Let’s believe. In one of Mayor Iveson’s addresses, he said that “Edmonton is a safe city because good people live here. The very best and bravest step forward to become first responders and we rely on them to protect us from the few and worst among us.” I have met the few and worst among us and I am learning not to be afraid of them. Lauren and other members of SACE have been instrumental in teaching me not to be afraid, to be strong and to stand up for myself and others. I am forever grateful for our first responders, to the staff at SACE, and to the community for being there in my time of need. I am incredibly proud to be an Edmontonian, and I hope that one day I can pay it all forward. Regaining my voice was a very long process. In October 2014 I was interviewed by the Canadian Press for an article about why victims don’t go to the police. I remained mostly anonymous, just giving my first name. Then in February of 2015, I was anxiously awaiting news about Jian Ghomeshi’s trial. I got fed up with victims being blamed, questioned, and not believed. So I decided to open up and share my story with the world. People weren’t listening to anonymous stories, and I thought maybe they would believe one with a name and face that they can relate to. I shared my story, along with my full name and a picture on a website called when you’re ready.org. When you’re ready is an online community for survivors to share their stories and offer support & encouragement to each other. My story was seen by 14,000 people all over the world and I am still hoping that it helped someone, anyone to feel less ashamed, more supported, and believed. I have since become a blogger for when you’re ready and made some great friends through the process. I am no longer going to be silent and afraid. I fought very hard for my life nearly 4 years ago, and I am still fighting in a lot of ways. I thank my lucky stars that I survived, and if I can ask the universe for one more thing, it is that I can be the 1 in 3 statistic for my two little sisters, Rachel and Molly. Thank you all for being here tonight. I would not be here without the support from SACE, from my parents who flew across the country to be here for me, and for my friends who encouraged me every step of the way. The Sexual Assault Centre of Edmonton is an essential part of our community and I am forever grateful for the services they provided me with, and continue to provide to survivors. The work they do here is difficult and can be bleak at times, but is so, so so important. We still have a long way to go but just look at how far we’ve come.